The Grandstream GXP2200EXT is the expansion module that has 40 additional display lines and can be used with the GXP2140 and the GXV3240. The GXP2200EXT module features a large 128 x 384 graphic LCD and 20 programmable buttons (each with dual color LED). 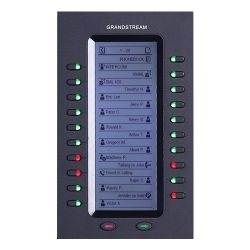 In addition, this Grandstream Expansion Module allows up to 40 extensions per module by using the 2 page switch keys and up to 160 buttons when 4 extension modules are daisy-chained together with the power being supplied and controlled by the base phone. The GXP2200EXT is the ideal solution for offices that manage high call volumes or an office receptionist. By using the GXP2200EXT, the telephone attendant can ensure maximum office productivity by efficiently monitoring and dispatching multiple incoming calls.